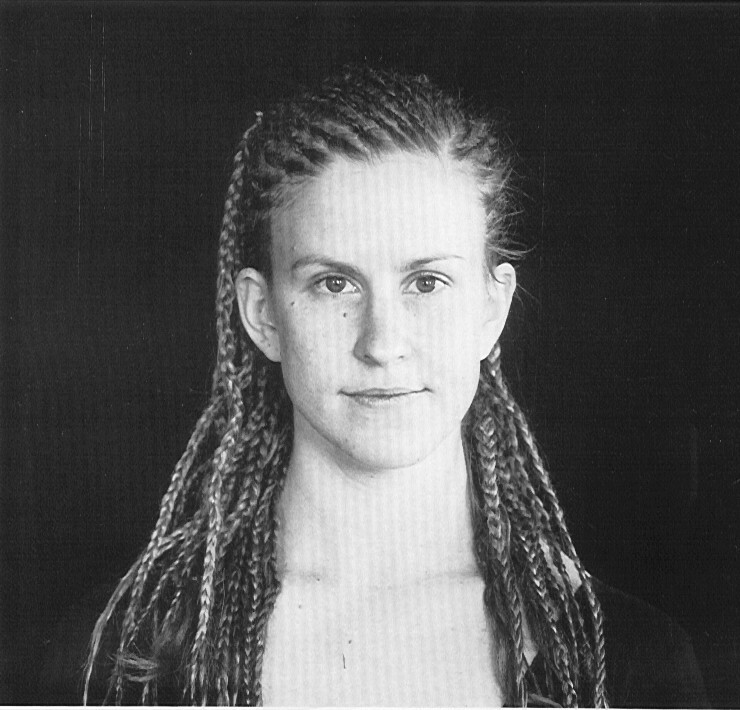 WWW.KALOSKAISOPHOS.ORG is the website of Mon Oncle D'Amérique Productions, an "association loi 1901" based in Paris presenting the artistic collaborations of American choreographer Clara Gibson Maxwell since 1987. 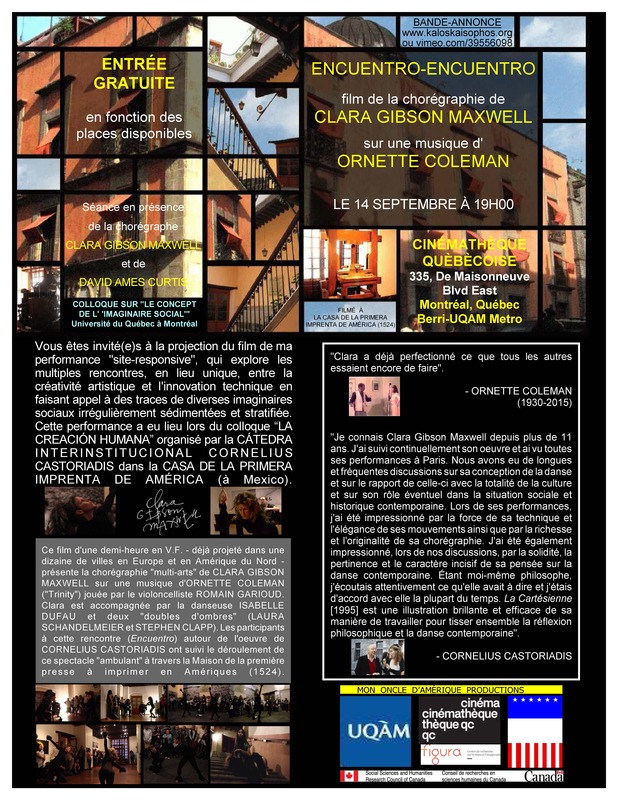 “Encuentro-Encuentro” - une chorégraphie “site-responsive” et “multi-arts” de la chorégraphe-philosophe Clara Gibson Maxwell - explore les multiples carrefours de rencontre entre la créativité artistique et l’innovation technique en faisant appel, d’une manière apodictique et non pas discursive, à des traces de diverses imaginaires sociaux irrégulièrement sédimentées et stratifiées dans un seul lieu. • un ordinateur qui fait entendre un extrait d’un texte du philosophe Cornelius Castoriadis sur la passion et les limites de l’informatique. Nous vous proposons une projection de la vidéo (34 minutes), dont le montage est une extension, une élaboration et un affinement des démonstrations artistiques et philosophiques de cette performance, en particulier le principe de doublement (qui ne veut pas dire répétition) cher à Ornette Coleman, compositeur du morceau de musique sur lequel dansent les interprètes et leurs doubles d’ombre, exemplifiant et prolongeant corporellement la théorie musicale démocratique de cet inventeur du “Free Jazz” - l’ “Harmolodics”, qui accorde une valeur égale à l’harmonie, à la motion (ou le rythme) et à la mélodie. In ancient Greek, "Kalos" meant "Beautiful" and "Sophos" meant "Wise." We do not claim to be or to incarnate "Beauty" and "Wisdom," but our creative collective efforts are directed toward those "ends," motivated and furthered by the love thereof. The love of Beauty and Truth is the first condition of possibility for their imaginative re-creation, just as the practice thereof gives one a taste of and for that love. and we love wisdom in a way that does not make us soft. and to philosophy, and yet without molification of the mind." we are lovers of culture, but without softness." Grene goes on to explain that Hobbes translated Thucydides' great work "in order that the follies of the Athenian Democrats should be revealed to his compatriots." Nevertheless, Hobbes the political absolutist offered us this "magnificent seventeenth-century translation" of his--one that admirably expresses the ideals of the Athenian democracy, despite his contempt for them. and we philosophize without the barbarian vice of effiminacy." In her text "The Crisis in Culture," where this translation is offered, Arendt's main concern was to reconcile "the Greeks"--who, she believed, were cultureless--with Cicero and Immanuel Kant by showing how "the Greeks" preceded these two of her favorite thinkers in the linking of "politics" and "art." But she also sought to highlight the differences between "the Greeks" and, on the one hand, "the Romans" (the latter are said to have originated culture) and, on the other hand, "the barbarians" (the latter are said to be viewed by the Greeks as softened by despotism)--not to appreciate the possible connection between philosophy, democracy, and art in ancient Athens, where this Funeral Oration was composed. Arendt thus provides no hint that Pericles' Funeral Oration was spoken in Athens amid a generation-long struggle of the democratic poleis against the Spartan-led oligopolies of the time. The contrast the Corinthians made elsewhere (1.70) between the hesitant and indecisive Spartans, on the one hand, and the Athenians who saw no contradiction between thought, feeling, and action, on the other, is missed entirely. And, finally, she misconstrued the Greek "middle voice" of philokaloumen and philosophoumen, speaking of the "love of beautiful things" and "philosophizing" each as "an activity" (action being one of her primary philosophical categories), rather than as a a kind of self-transformative (and society-transforming) process, wherein the collective passion for democracy would be as important as any action undertaken by individuals, great or otherwise. The substantive conception of democracy in Greece can be seen clearly in the entirety of the works of the polis in general. It has been explicitly formulated with unsurpassed depth and intensity in the most important political monument of political thought I have ever read, the Funeral Speech of Pericles (Thuc. 2.35-46). It will always remain puzzling to me that Hannah Arendt, who admired this text and supplied brilliant clues for its interpretation, did not see that it offers a substantive conception of democracy hardly compatible with her own. In the Funeral Speech, Pericles describes the ways of the Athenians (2.37-41) and presents in a half-sentence (beginning of 2.40) a definition of what is, in fact, the "object" of this life. The half-sentence in question is the famous Philokaloumen gar met'euteleias kai philosophoumen aneu malakias. In "The Crisis in Culture" Hannah Arendt offers a rich and penetrating commentary of this phrase. But I fail to find in her text what is, to my mind, the most important point. Pericles' sentence is impossible to translate into a modern language. The two verbs of the phrase can be rendered literally by "we love beauty . . . and we love wisdom . . .," but the essential would be lost (as Hannah Arendt correctly saw). The verbs do not allow this separation of the "we" and the "object"—beauty or wisdom—external to this "we." The verbs are not "transitive," and they are not even simply "active": they are at the same time "verbs of state." Like the verb to live, they point to an "activity" which is at the same time a way of being or rather the way by means of which the subject of the verb is. Pericles does not say we love beautiful things (and put them in museums), we love wisdom (and pay professors or buy books). He says we are in and by the love of beauty and wisdom and the activity this love brings forth, we live by and with and through them—but far from extravagance, and far from flabbiness. This is why he feels able to call Athens paideusis—the education and educator—of Greece. In the Funeral Speech, Pericles implicitly shows the futility of the false dilemmas that plague modern political philosophy and the modern mentality in general: the "individual" versus "society," or "civil society" versus "the State." The object of the institution of the polis is for him the creation of a human being, the Athenian citizen, who exists and lives in and through the unity of these three: the love and "practice" of beauty, the love and "practice" of wisdom, the care and responsibility for the common good, the collectivity, the polis ("they died bravely in battle rightly pretending not to be deprived of such a polis, and it is understandable that everyone among those living is willing to suffer for her" 2.41). Among the three, there can be no separation; beauty and wisdom such as the Athenians loved them and lived them could exist only in Athens. The Athenian citizen is not a "private philosopher," or a "private artist," he is a citizen for whom philosophy and art have become ways of life. This, I think, is the real, materialized, answer of ancient democracy to the question about the "object" of the political institution. When I say that the Greeks are for us a germ, I mean, first, that they never stopped thinking about this question: What is it that the institution of society ought to achieve? And second, I mean that in the paradigmatic case, Athens, they gave this answer: the creation of human beings living with beauty, living with wisdom, and loving the common good. Thucydides. The Peloponnesian War. 2 vols. Trans. Thomas Hobbes. Ed. David Grene. With an introduction by Bertrand de Jouvenel. Ann Arbor: The University of Michigan Press, 1959. Hannah Arendt. "The Crisis in Culture." Between Past and Future: Six Exercises in Political Thought. New York: The Viking Press, 1961. Cornelius Castoriadis. "The Greek Polis and the Creation of Democracy" (1983). Philosophy, Politics, Autonomy. Ed. David Ames Curtis. New York: Oxford University Press, 1991.